The Regional Water Data Banks Project, a project of the Multilateral Working Group on Water Resources, is managed by a steering committee known as the Ex ecutive Ac tion T eam (EXACT). It is composed of two representatives from each of the Core Parties (Israelis, Jordanians, and Palestinians) and from each of the Donor Parties. The Donor Parties currently include the United States, European Union, and The Netherlands. Donor Parties whose projects have been completed include Canada (2003), France (2003), and Australia (1997). The United States, represented by the USGS, serves as the Gavelholder and Executive Secretary of EXACT. Multilateral Water Resources Working Group decision-making procedures apply to EXACT (decisions made by Core Party consensus). Representatives from additional and potential donor countries are welcome to participate in EXACT meetings, and representatives frequently attend EXACT meetings as observers. Since its inception, EXACT has met twice each year to plan, coordinate, and direct project implementation. The USGS serves as the host for all of the EXACT meetings, handling all of the meeting logistics, serving as host, and conducting a variety of technical activities. EXACT has become a standard, in areas of conflict, by which other project management schemes are measured. 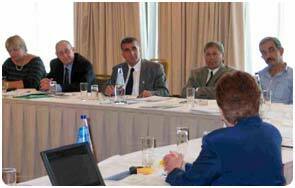 Israeli and Palestinian representatives at an EXACT meeting being chaired by Anna Lenox (USGS, IWRB, Reston). Ambassador Thomas Miller, U.S. 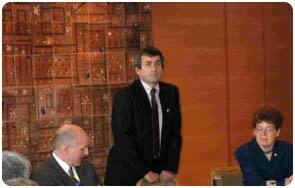 Ambassador to Greece, addressing the EXACT meeting held in Athens, Greece in October 2003. 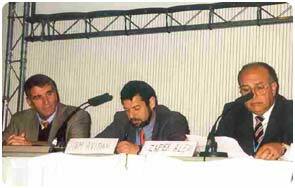 Palestinian, Israeli, and Jordanian representatives jointly presenting a paper describing the Regional Water Data Banks Project at the World Water Forum held in The Hague, March 17-22, 2000. Tie In: The U.S. Department of State requested the USGS to undertake this activity and has provided political guidance and funding throughout the project. The project supports directly U.S. foreign policy goals and demonstrates USGS leadership in the natural sciences through scientific excellence and responsiveness to global needs.